At Pure Charity, we give the ability for individuals or communities to rally around one another and directly get involved in fundraising for others. This is all possible through Fundraise for this Cause. When an individual or organization launches a fundraiser, each fundraiser has a button on the right side of the page called Fundraise for this Cause. If someone chooses to click the button, they will brought to a page where they will create their own fundraiser based off of the original fundraiser. This secondary fundraiser is called a "child" fundraiser to the original fundraiser, now coined the Parent fundraiser. All of the funds raised in the Child Fundraiser (aka Fundraise for the Cause Fundraiser) will go towards the Parent fundraiser, but can be organized by another individual. In the child fundraiser, you can choose to raise as much money as you want and have flexibility to brand and name the fundraiser as you please. How does the parent fundraiser receive the funds? Any funds raised in the Child Fundraiser will show up in the progress bar of the Parent Fundraiser. The Parent Fundraiser receives the funds the same way as they would receive their own, the organization will grant on their behalf. Will all of the donors in a child fundraiser appear on the Donations list of the parent fundraiser? No. Only the donors and funds will show on the Donations list on the Parent Fundraiser. If the Parent Fundraiser would like to send thank you notes to those donors, they will have to ask for contact information from the Child Fundraiser organizer or the organization they are fundraising with. Though the donors do not show on the Donations list, ALL donations raised from a Parent or Child Fundraiser DO reflect in the Parent's Fundraiser donations bar. Where is Fundraise for the Cause button located? 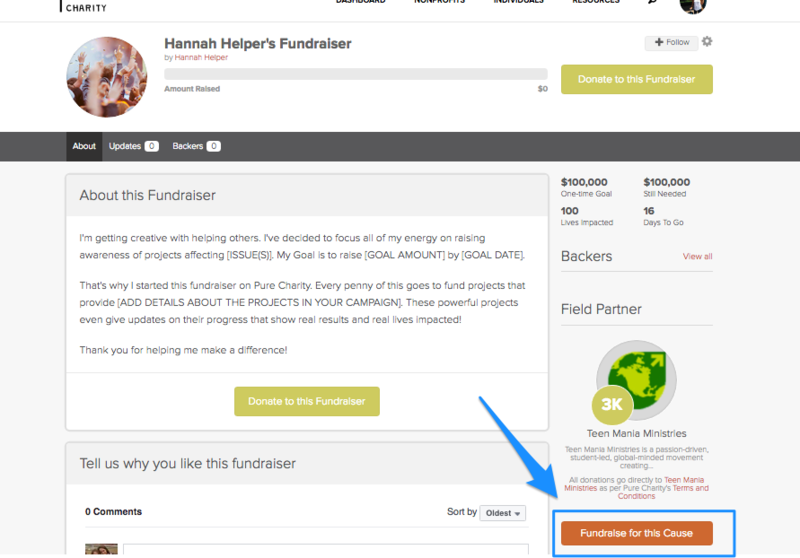 You can find the Fundraise for the Cause button located on the right side of a Fundraiser.